Ambleside is a busy Cumbrian town less than half a mile from Windermere. It lies within the borders of the Lake District National Park and is extremely popular with walkers and other tourists. The history of Ambleside dates back to at least Roman times, though most of the buildings now standing were built in Victorian times using the local dark grey stone. Ambleside offers a good choice of accommodation options ranging from small, privately owned guest houses and bed and breakfasts, to large hotels with extensive facilities. Bridge House is the most famous and picturesque building in Ambleside. This tiny cottage sits on a small bridge over Stock Ghyll and was built over 300 years ago as an apple store for nearby Ambleside Hall. It now serves as a National Trust shop and information centre and is one of the most photographed buildings in the Lake District. Another impressive building is St Mary’s Church, completed in 1854 and designed by Sir George Gilbert Scott, architect of London’s Albert Memorial and the Foreign and Commonwealth Office building. Inside the church is a chapel dedicated to William Wordsworth and a large mural depicting the town’s annual Rushbearing Ceremony. The history of Ambleside can be explored at the Armitt, a combined museum, library, and art gallery founded at the beginning of the 20th century. Its collection includes over 400 watercolour paintings by Beatrix Potter and images of the Lake District by Victorian photographer Herbert Bell. Ambleside Sports is the town’s major sporting event and is held annually on the last Thursday in July. It features traditional Lakeland sports such as Cumberland and Westmorland wrestling, fell and guides races, and hound trails. Zeffirellis is a 4-screen independent cinema in the heart of Ambleside offering a mix of art house films and Hollywood blockbusters. It also offers a restaurant, café, and jazz bar. South of the town is Waterhead, a small harbour at the head of Lake Windermere. Windermere Lake Cruises operate from here and offer a regular schedule of boat cruises to Bowness and Lakeside. Borrans Park is situated just west of the jetties at Waterhead and offers magnificent views of Windermere. It also features the remains of the Roman fort of Galava. 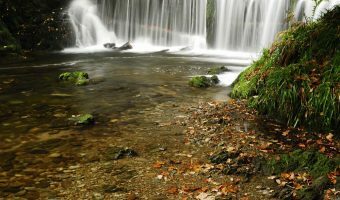 Other parks and gardens in the area include Stock Ghyll Park featuring the magnificent Stock Ghyll Force, Rothay Park and the National Trust’s Stagshaw Garden. Low Wood Watersports and Activity Centre at the Low Wood Hotel offers a good range of water-based instruction, including dinghy sailing, kayaking, canoeing, water-skiing and wakeboarding. Rowing and motor boats, dinghies, kayaks and canoes can also be hired. Drivers coming from the south should leave the M6 motorway at Junction 36 and take the A590 / A591 to Ambleside. Those coming from the north can exit at Junction 40 and take the A66 / B5322 / A591. South Lakeland District Council operates several pay-and-display car parks in Ambleside. The Rydal Road Car Park (LA22 9AY) offers 170 spaces and is situated to the north west of the town, close to the Armitt. The biggest car park in Ambleside, with spaces for 215 vehicles, is the Miller Bridge Car Park (LA22 0EE). It is situated on Rothay Road just south of the town centre and towards Waterhead. Others include the car parks on Lake Road Car Park (LA22 0DB – 47 spaces) and the Low Fold Car Park (LA22 0DN – 45 spaces). Free on-street parking is available in Ambleside town centre between 10 am and 6 pm but is limited to one hour or 30 minutes (check the roadside sign). A parking disc with the arrival time displayed must be placed on the vehicle dashboard. Parking discs can be obtained from most shops, hotels, and guesthouses. There is no train station in Ambleside. 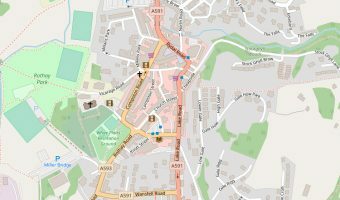 The closest railway station is in Windermere (4 miles by road). First TransPennine Express operates direct trains from Windermere to Manchester / Manchester Airport and Oxenholme. Oxenholme is on the West Coast Mainline and is served by Virgin Trains services between Scotland and Birmingham / London. One of the main buses to Ambleside is the 555 service between Lancaster and Carlisle. It calls at Bolton-le-Sands, Carnforth, Milnthorpe, Levens Bridge, Kendal, Staveley, Windermere train station, Troutbeck Bridge, the Lake District Visitor Centre at Brockhole, Waterhead (for Windermere Lake Cruises), Ambleside, Rydal, Grasmere, and Keswick. Another long distance bus calling at Ambleside is the 618 from Barrow-in-Furness. Stops on the journey include Dalton, Ulverston, Haverthwaite (for Lakeside and Haverthwaite Railway), Backbarrow, Newby Bridge, Fell Foot Park, Bowness, Windermere train station, Troutbeck Bridge, the Lake District Visitor Centre at Brockhole, and Waterhead. The X8 bus service from Chorley to Keswick runs in the summer months. It calls at Preston, Windermere train station, Ambleside, and Grasmere. Local bus services include the 505 from Coniston to Ambleside (calls at Monk Coniston, Hawkshead Hill, Hawkshead, and Skelwith Fold) and the 516 service from Dungeon Ghyll to Ambleside (stops at Chapel Stile, Elterwater, and Skelwith Bridge). The National Express coach service from London to Whitehaven calls at Birmingham, Wigan, Preston, Lancaster, Morecambe, Carnforth, Kendal, Windermere, Ambleside, Grasmere, Keswick, Cockermouth, and Workington.